Spaghetti and Meatball Recipe – our juicy meatballs in a homemade sauce served over a bed of spaghetti! Sharing our version of the classic Italian dish, it’s easy to make and your pickiest eaters will approve. This is the perfect recipe to have the kids help with dinner, they love making the meatballs. For a lazy dinner, our Easy Meaty Spaghetti Recipe is completely ready in under 30 minutes. There is just something so comforting about homemade spaghetti and meatballs. It always feels like you’re at an Italian restaurant but for a fraction of the price. 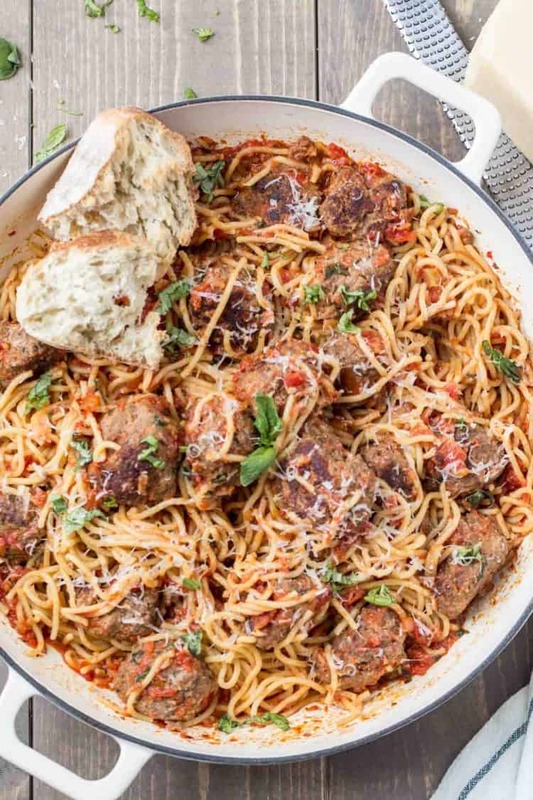 The big, juicy and tender meatballs in quick homemade sauce over pasta spaghetti is so good! All the flavors come together and are just amazing. The ingredients needed for meatballs are pretty simple but play a big role in giving the juiciest and most flavorful meatballs. You most likely already have all of these ingredients in your pantry! Lean meat– use an 85% – 90% lean meat, you want some fat but not too much. Breadcrumbs– the breadcrumbs and Parmesan cheese add texture to the meatballs. Garlic and onion– enhance the flavor of the meat. Mayo– I know, a little unexpected but it acts as a tenderizer and you cannot taste it. Basil– because basil is a must in meatballs. If you don’t have fresh basil, dried basil will work just fine. Use about 3:1, fresh to dried herbs, or to taste. Milk and eggs– add juiciness to the meatballs and keeps them from drying. Can I substitute breadcrumbs for bread? What kind of meat should I use for meatballs? You can really experiment with your favorite meat. We like beef as a must and add other meats to enhance flavor. Italian sausage, ground pork or ground turkey may all be mixed with the beef with great results. In a bowl, combine the ingredients for the meatballs. Mix together the meat, finely grated onion, minced garlic, mayo, eggs, milk, parmesan cheese, fresh basil and seasonings. Once well incorporated, shape meatballs. You’ll have about 18 large meatballs (about 3 per serving). Sautee meatballs until fully cooked, cook in 2 batches so you don’t overcrowd the pan. Remove meatballs from skillet, cover to keep warm. In the same skillet, saute the onions. Add tomatoes, garlic, water and seasonings (minus basil) and cook over low heat about 5 minutes, stirring frequently. With a hand mixer, blend the sauce until desired consistency. We don’t like chunks so I blend it until the sauce is pureed. Add meatballs to sauce and simmer over low heat 10 minutes. While meatballs are simmering, cook the spaghetti. Drain spaghetti. Add fresh basil to meatballs and sauce. You can serve spaghetti and meatballs in two different ways. 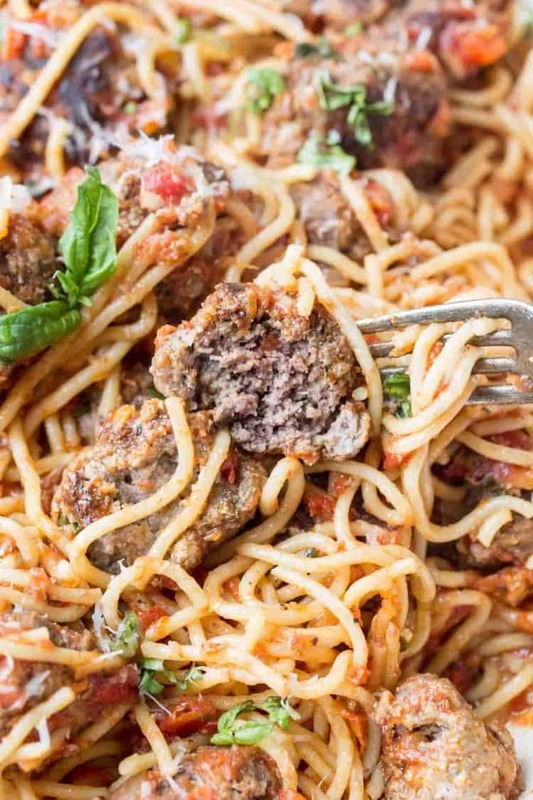 Serve meatballs and sauce over spaghetti. If serving this way, add a tablespoon of butter to the spaghetti once you drain them. Or, mix the spaghetti into the meatballs and sauce. This is the way we like it, makes it so much easier when serving. Chicken Marsala– Mushrooms and chicken in creamy wine sauce. Chicken Parmesan- Crispy chicken breast with homemade sauce. Chicken Scampi– Olive Garden’s copycat version, but so much better. Mushroom Chicken Pasta– So easy to make, family favorite. I can’t wait for you to give this classic Italian dish a try. 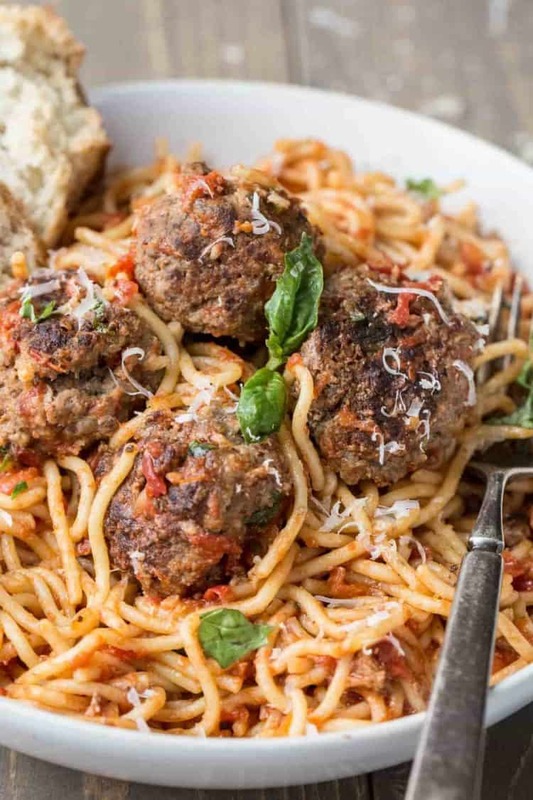 Prepare to be wowed by the recipe meatballs and spaghetti recipe. No self-control here, but no one is looking, sooooo.. The most amazing recipe for classic Italian inspired Spaghetti and Meatballs Recipe. 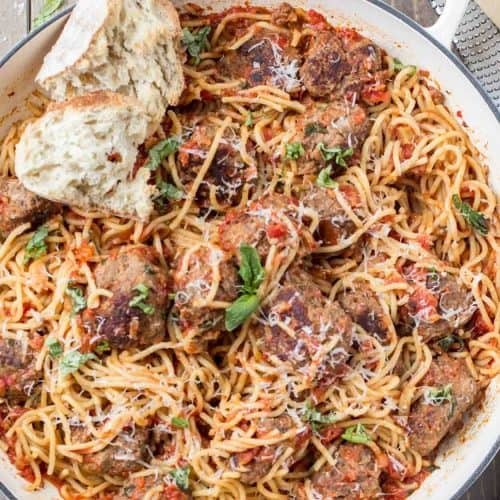 Big, juicy and tender homemade meatballs in a quick pasta sauce and served over a bed of spaghetti. Grate onion on the small protruding holes’ side of the grater. In a bowl, combine all the ingredients for meatballs. 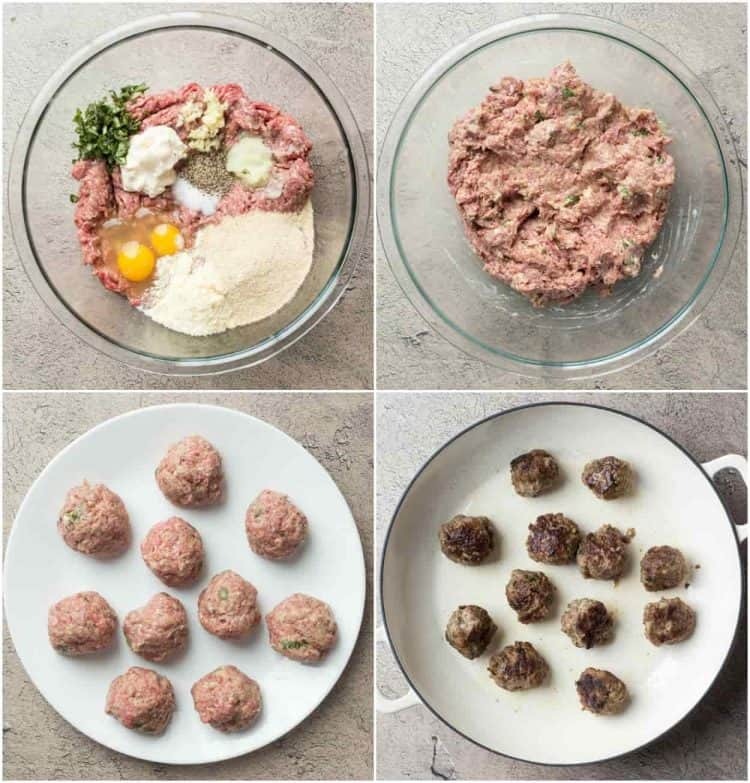 Form 1 - 1 ½ inch round meatballs, packing meatballs tightly as you are shaping them, yields about 18 meatballs. Coat the bottom of a large skillet with oil half the oil. Once hot, add the meatballs. Cook meatballs until fully cooked, cook the second batch. with remaining oil. In a skillet, sauté the finely chopped onion with oil and butter. Once onions are cooked, add diced tomatoes, water, garlic and seasonings (minus fresh basil). Simmer on low for about 5 minutes. Puree the marinara sauce with a hand mixer or blender until desired consistency. Add back to the skillet. Add meatballs and fresh basil to sauce, simmer 10-12 minutes over low heat. While meatballs are simmering, cook spaghetti per package instructions. Drain and toss with 2 Tbsp butter. Serve spaghetti and meatballs with grated Parmesan cheese, if desired.